There are many health benefits of dragon fruit. Dragon fruit is a beautiful fruit with an intense color and shape, the flowers were breathtaking. Like blooms at night, this fruit also called Moonflower, Queen of the night, and the Lady of the Night. Usually the fruit is dark red, it can also be found in yellow or pink. Dragon fruit was originally known as pitaya. This night-flowering cactus plant is also known as strawberry pear, skogkaktus, pa-ni-ni, catobarse and long gou. Originating in Mexico and South America, this fruit is now also grown commercially in Asia. 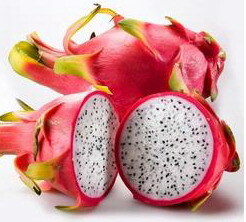 Dragon fruit have a taste similar to that of kiwi fruit, pear and watermelon. There are a lot of seeds in the dragon fruit. Apparently the seeds are unsaturated fats that are good for health because it lowers good cholesterol and expel the bad cholesterol. Dragon fruit is very versatile and can be served in many ways. Dried dragon fruit can be added in salads. This creates a healthy chewy texture. It can also be used as a topping in pizzas. If you are fond of eating breads, you can make your own dragon fruit jam or preserves. As a dessert, it is great to eat a fresh pitaya or dragon fruit as a whole or as a compliment to ice cream. You can even use it as an ingredient in your homemade cocktail.